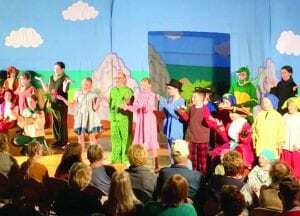 Members of the cast from the play “Peter and Wendy” sang a song as the show came to a happy ending during the performance given Saturday afternoon at the school gym. The musical production was part of the Missoula Children’s Theatre, which cast around 40 children and put together the show during just a week of rehearsals. The Gettysburg School and Maas Foundation made the project possible for the young actors. Scan the photo with the PCN smartphone app to see a video of the song.